JIMMY CHOUX (NZ) (Bay 2007-Stud 2012). 12 wins-3 at 2, New Zealand Derby, Gr.1. Leading NZ First Season Sire 2015-16. Sire of 97 rnrs, 44 wnrs, inc. SW Manolo Blahniq (ARC Eclipse S., Gr.3), Bostonian, SP Jimmy Lincoln - Great Profit (H.K. ), The Great Southern, What Choux Want, Secret Ambition, Addison, Cobblertothestars and of Batabullet, Chambon, Chaussure, Heptagon, Hoofaloof, Poker Face, Sweet Varden, Midnight Runner, Ballet Choux, etc. Moirai, by Not a Single Doubt. 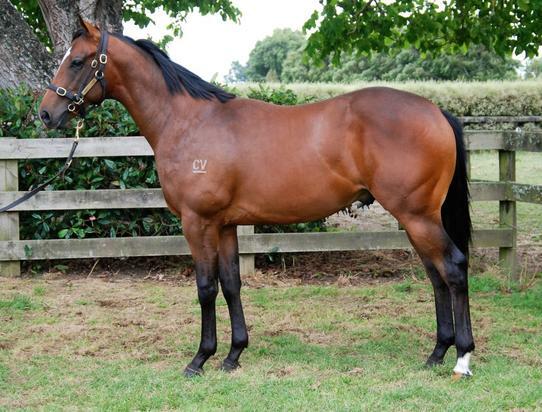 5 wins at 1000m, 1200m, Southland RC Southern Bolts & Fasteners H., Waikato RC The Meat Warehouse H., 2d Whangarei RC Westbury Stud S., L, CJC Riccartonpark.co.nz H. This is her third foal. Her second foal is a 2YO. Her first foal is unraced. Moirai (Not a Single Doubt). 5 wins. See above. Clermont Club. 7 wins from 1600m to 1900m, S$257,559, to 2017, Singapore TC Initiation P., Better Than Ever S., Kranji D S., Class 5 H.-3 times, Stepitup S., 2d Singapore TC Class 5 H.-6 times, 3d Singapore TC Capablanca S., Class 4 H.-twice, Kranji D S., Class 5 H.-7 times. Flyboy. Placed, 2d Singapore TC Initiation P.
QUORUM (Zieten). Top colt on The 1998-99 NZ 2YO Free H. 4 wins-3 at 2-to 1200m, NZ$236,925, S$63,100, WRC Magic Millions Classic S., RL, 1200m-in track record time, ARC Saints Juvenile H., Singapore TC Class 1 H., 1200m-in track record time, Waikato RC Bloomsbury Stud Juvenile H., 2d ARC Windsor Park Breeder of the Year Juvenile H., Counties RC Pukekohe Ford Juvenile H. Sire. Smart Decision. 9 wins to 1400m, 130,675Rgt., S$270,793 in Malaysia and Singapore, Singapore TC Class 3 H.-3 times, Class 4 H., 2d Singapore TC Class 2 H., Benchmark 74 H., Class 3 H., Progress, Classes 3 & 4 H., Class 4 H., 3d Singapore TC Benchmark 95 H., Benchmark 75 H., Class 4 H.
Velazquez. 2 wins at 1100m, 1250m in Aust. Committee of One. Winner at 5½f in U.S.A. Windfalls. Placed at 2, 3d HKJC Tsang Tai Uk P.
J. C. Decides. Placed at 3 in U.S.A.
BOATING PLEASURE (Flying Paster). 9 wins-3 at 2-from 5½f to 8½f, US$205,575, Santa Anita California Cup Juvenile S., L, 3d Santa Anita Debonair Junior H., L.
Yearly Committee. 5 wins in U.S.A. Producer. Wine Committee. 4 wins-1 at 2- in U.S.A. Producer. Committee Decision. 4 wins. See above. Brahma Fear. 2 wins-1 at 2-at 4½f, 6½f in U.S.A. In To. 2 wins at 6f in U.S.A. Brother Roy. Winner at 6f in U.S.A.
Softail Mark. Winner at 2 in U.S.A. Magical Mon. Winner at 8¼f in U.S.A. Sire. Meadow Mango. Winner at 4½f in U.S.A.
Elmayer (Sharpen Up). 2 wins in GB and U.S.A, Doncaster Hall Gate S., 2d Longchamp Prix Lupin, Gr.1. Sire. Legacy Hunter (Nureyev). 5 wins-1 at 2-at 1600m, 1800m, 81,899,000¥, Tokyo Hakushu S., 2d Fukushima Kinen, L.
Delightful Year (Half a Year). 2 wins-1 at 2, 3d Solano County Juvenile Filly S., L. Producer. Fiore Harbor (Gold Allure). 11 wins-4 at 2-from 800m to 1700m, 3d Sonoda Hyogo Championship, L.
Marjan (Cappuccio). 4 wins-1 at 2-at 6f, 1m, 2d Northlands Park Canadian Juvenile S., L.
Pink Flash (Flashy Bull). 5 wins from 6f to 8¼f, 2d Oaklawn Park Downthedustyroad Breeders S., L, 3d Oaklawn Park Rainbow Miss S., L.